Let me start with good news. Decode and Conquer (D&C) sales have been scorching 🔥 this month! If you've been following who gets job offers from Facebook 👥 and Google, you know that candidates prefer D&C over other PM interview prep books. Google's recruiters are also big fans of D&C. Business Insider revealed that Google's recruiters prescribe my CIRCLES Method™ as the #1 method when preparing for product design questions. Google recruiters also recommend my on-demand, coding interview prep materials too. Speaking of Google, I'm honored to share a brand new Google PM interview cheat sheet with all of you. It's fun, colorful, and Googley. More importantly, it covers all the different question types you'd encounter at the interview including product design, technical, analytical, and strategy. 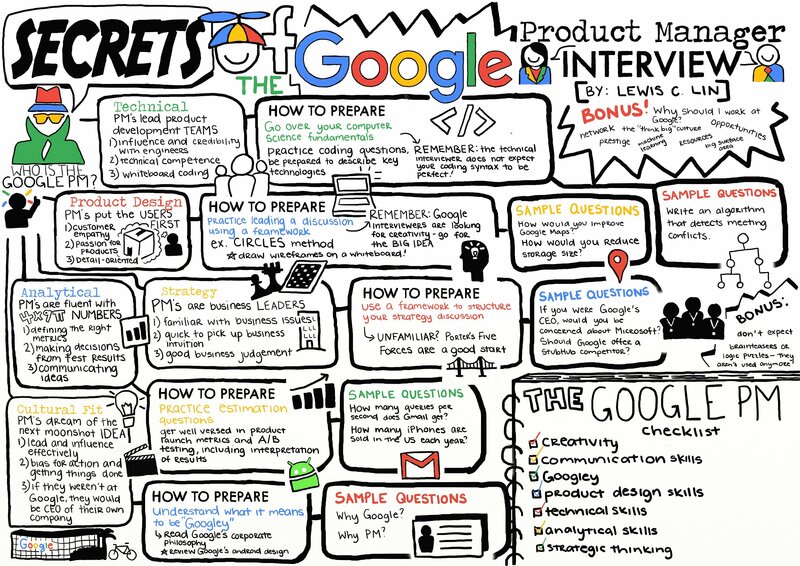 This cheat sheet is based on my latest book, Secrets of the Product Manager Interview. Google PM candidates erroneously believe that they the reason they didn't get a Google PM offer is because they failed the whiteboard coding interview. #1 reason why candidates fail: poor responses to product design questions. How would you design a better smoke detector? Design an new iPad app for Google spreadsheet. Product design questions aren't covered by the standard MBA curriculum nor consulting case interview prep. Suffocating time pressure. Great products, such as the iPhone are not built in a day, let alone a 45-minute interview. Limited domain knowledge. How can candidates suggest smoke detector innovations if they don't know how they work? No support. Real-life innovation happens in teams; team members can build on each other's ideas. No such support system exists in a solitary closet-sized interview room. To do well requires lots of practice. And the best place to start is the CIRCLES Method™. If I had a Google PM interview, and I could only bring one cheat sheet...this would be it. Print out the high-resolution version of this cheat sheet, available in both JPG and PDF. I am excited to announce my newest book, Secrets of the Product Manager Interview. I've collected over 10 years of questions from my readers, coaching clients, and workshop attendees. I've answered them and extracted the essence. Now, I'm revealing those secrets with you. This book is different from my other Amazon.com bestsellers, Decode and Conquer and PM Interview Questions. On the one hand, those books are focused on frameworks and practice questions. On the other hand, this new book, Secrets of the Product Manager Interview, is focused on my secrets, answers, and everything you need to know about the product manager interview process. And yes, this book is available in paperback and Kindle. P.S. I'll be completing my last workshop for the 2016-2017 season on March 25th at the University of Texas! If you're attending, please introduce yourself and say hello! "Lewis, your interview workshop was a tremendous learning experience! I sense your passion for product management and your desire to help students like me prepare for PM interviews! I wish I had your workshop before my Google and Facebook PM interviews last year." "I loved the interactive exercises. It was fun, and I learned. I only wish our regular professors would teach course material Lewis Lin's way." "Content-wise, the workshop yesterday was super helpful. Lewis Lin's presentation & training is very professional." "I learned a lot from Lewis Lin's interview workshop. The best part of the talk, other than the tools and tactics, was the engagement model. You gave us an opportunity to not only exercise our brain muscles but also work in teams. It was a great learning experience." "I cannot thank you enough for making the trip out to Salt Lake City. You completely blew it out of the water today, and I feel fortunate to have the opportunity to learn from you. The students got a lot out of the session, and they will surely be more prepared for interviews. You were incredibly inspiring and have a true gift presenting to groups." "Having Lewis Lin lead a product management interview workshop is the most relevant and useful PM career prep I've received during my time at Haas." "It was a pleasure attending your workshop. I admire that your mother had the opportunity to attend. I can imagine how proud she must be seeing the great work you are doing to help others succeed in their career." "Today's workshop was amazing! The best part is to attend the author's workshop and to meet him in person. It makes my future preparation and reading more interesting. I now have a clearer picture, visualizing concepts described in the book and better connecting the dots better!" Tech Interview Workshop at UC Irvine. Nov. 5, 2016. LEWIS C. LIN is a bestselling author. His books focus on product management, marketing and negotiation. Lewis received his bachelor's from Stanford University and his M.B.A. from Northwestern University's Kellogg School of Management.